Suffolk County Council’s budget forecast paints worrying picture A Cabinet paper last week revealed that Suffolk County Council is forecasting an overspend of £10.2m on their 2017/18 revenue budget. The majority of this overspend is within Adult & Community Services (£2.3m) and Children’s Services (£6.4m). The narrative that ‘savings’ (eg ‘cuts’) can continue is increasingly unsustainable. “Leaner and fitter” has morphed to anorexia. Opposition councillors are growing increasingly concerned: latest budget forecasts make it clear that, unless major changes occur, the Council’s finances are not sustainable in the long-term with the most vulnerable members of our county the most likely to suffer the consequences. Suffolk County Council has had to make significant savings in response to continuing cuts in funding from central government. Demand for services, however, has continued to grow. This is no surprise to anyone. However, while there is no denying the issue of chronic underfunding from central government, Suffolk County Council has plumed itself on capping council tax for years . (Leader Colin Noble memorably maintained: “the vast majority of those on fixed pensions do not look to council services to help them in their old age. So he majority of old people are not reliant on libraries, buses, roads, care services, public health? News to me, and to them. And to Cllr Noble, clearly). The administration called instead for for Suffolk to innovate in income generation. Suffolk County Council’s Leader on the needs of old people on fixed pensions. What world is he living in? Disappointingly this income has failed to materialise. This is tragic. 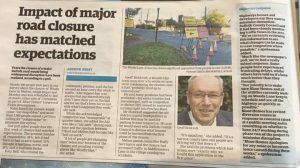 Proper investment in Suffolk’s economy, combined with regular tiny increases in council tax over the years, could have done much to avert the current worrying situation. Home to School Transport – workshops announced In September, our LDGI Group successfully “called-in” the Cabinet’s decision to go to consultation on changes to the Home to School Transport policy, questioning the nature of the pre-consultation period, and arguing that more research needed to be done. The Scrutiny Committee agreed with us, and voted to refer the decision back to Cabinet for further consideration. It has not yet been announced when Cabinet will reconsider the proposals. Suffolk County Council has announced that two workshops will be taking place in November, to further discuss the challenge and help develop proposals for Cabinet to consider. However, invitations will only be sent to 80 randomly selected representatives. If you have not been invited, and feel that you should be a part of these workshops, you can contact either myself or schooltravel@suffolk.gov.uk. Motion to improve early years funding rejected by Council At the meeting of Council on Thursday 19th October, our LDGI group supported a Labour motion which called on the Council to (1) lobby central government for more funding in Suffolk and (2) pass the full amount of funding received on to providers. Unfortunately, the Conservative majority refused to back the motion. Since September 2017, working families are entitled to 30 hours of free childcare, whilst all families are entitled to 15 hours of free childcare. Suffolk is one of only 37 local authorities which this year had a reduction in early years funding, receiving a total of £31 987 186. This equates to £4.41 per hour. However, childcare providers receive a base rate of only £3.87 per hour, and many are struggling to run their businesses on this low rate. The motion highlighted the difficulty faced by childcare providers across the county, and questioned why the Council did not pass through a higher rate of funding to providers. Bus timetable changes and issues due to Woods Lane Closure The closure seems to be proving as problematic as forecast. First are using shuttle buses to extend the 800 Park and Ride journeys beyond Woodbridge due to delays on account of the Woods Lane works. I have already had one complaint that these are not integrated in ticketing terms with the P&R services. It also seems that the notices on the suspended bus stops on Bredfield Road is leading a number of older residents to assume that bus services are completely suspended therefore entrapping them in this part of Woodbridge. The temporary shuttle bus stops are not clearly signed and the shuttle bus does not adequately cover for the suspended bus stops. Social Worker of the Year: former Kyson pupil nominated second year running The Coastal and North East Ipswich Child in Care social work team is a finalist in the Social Worker of the Year Awards 2017 as a result of their outstanding work with children and their families. Members of the team have previously been recognised for their outstanding achievements, including (I am very proud to say) former Kyson pupil Emily Tiplady-Ead whose immense professionalism and skills made herlast year’s national ‘Children’s Social Worker of the Year ’. Hearty congratulations, Emily! Closure has matched expectations? Now theres a surprise. 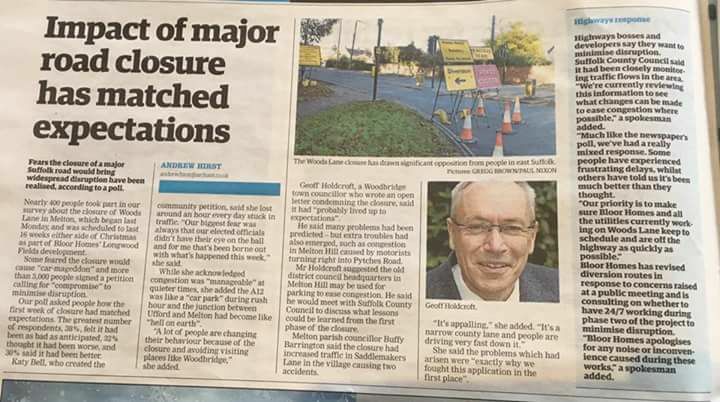 I continue concerned for independent Woodbridge retailers whose November/Decembr profits will be damaged by people electing not to drive into Woodbridge to shop, as well as all the residents, pupils and workers affected as they travel to Woodbridge daily. I’ve come back from China to see continuing controversy re Bloors and development – at both Melton Hill and Woods Lane.